There are different varieties of VR games . The centre is spacious . The staff is helpful and kind . The waiting time is very short . 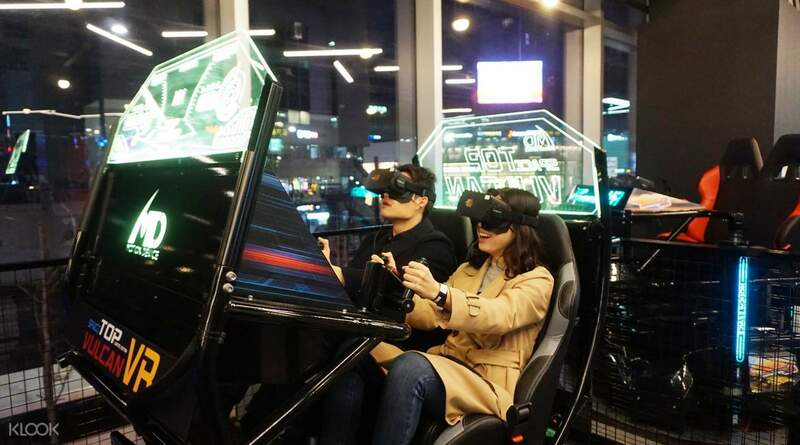 Experience the thrilling wold of virtual reality like no other in Seoul’s trendy and modern district, Hongdae. Let reality and fantasy come together in this popular VR arcade and play as many games as you want for four hours! Choose from the best and latest VR games equipped with nine exciting themed games for your gaming pleasure. Ride the ups and downs of a virtual roller coaster, explore 360 degrees of panoramic virtual sights, take on adventures and witness dinosaurs before extinction, fly through space in jets, shoot and aim at bad guys and pesky zombies, race to the finish line against friends or other players, and feel yourself physically moving in sync with the scenes playing behind your eyes! 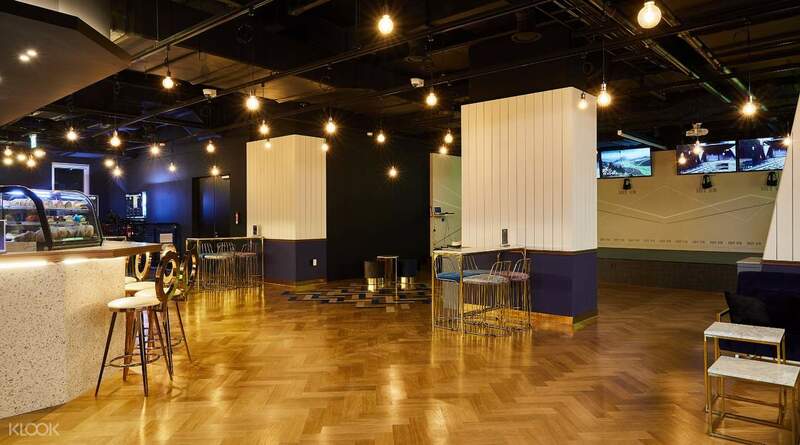 Restore lost energy and grab a bite or two of Korean delicacies in the arcade's cafe. Prepare yourself for a gameplay of the senses like never before and make all your fantasies come true in this VR Arcade adventure, perfect for children and young at heart! We have checked the shop opening hours. It closes at 10:00pm on weekdays. Since we had to finish our dinner before we played, we arrived at around 8:30pm and clicked to buy after we were sure that we found the right place. As there is no other customer inside the shop, the staff could serve us immediately as soon as we finished one. Finally we had played all games once before we left at 9:45pm. Locker: 1000won each. Warm reminder: Avoid going there after you eat a lot as the games make you feel dizzy. We have checked the shop opening hours. It closes at 10:00pm on weekdays. Since we had to finish our dinner before we played, we arrived at around 8:30pm and clicked to buy after we were sure that we found the right place. As there is no other customer inside the shop, the staff could serve us immediately as soon as we finished one. Finally we had played all games once before we left at 9:45pm. Locker: 1000won each. Warm reminder: Avoid going there after you eat a lot as the games make you feel dizzy. The activities were awesome! Fun, diverse range & in new condition. It is arcade size more than a theme park size. Good value for money - 4 hours means you can get through all the rides & pop out for a meal. The staff were nice, but some staff, rushed you off equipment even though it wasn't busy (always at least half the equipment was sitting unused). The cafe was nice & classy. Found it hard to find - no obvious street signposting so I have attached an image. It is on Level 2 above/to the right hand side, of the Line Friends shop. The activities were awesome! Fun, diverse range & in new condition. It is arcade size more than a theme park size. Good value for money - 4 hours means you can get through all the rides & pop out for a meal. The staff were nice, but some staff, rushed you off equipment even though it wasn't busy (always at least half the equipment was sitting unused). The cafe was nice & classy. Found it hard to find - no obvious street signposting so I have attached an image. It is on Level 2 above/to the right hand side, of the Line Friends shop. Way much cheaper than walk-in ticket. We finished all the games in 1.5 hours, 4 hours is way too much if you just wanna give a try to everything. Way much cheaper than walk-in ticket. We finished all the games in 1.5 hours, 4 hours is way too much if you just wanna give a try to everything. We loved our experience! Kids had so much fun! My 7 and 9 years old can do most arcades except two of them. Service was awesome on a weekday. Highly recommend this! We loved our experience! Kids had so much fun! My 7 and 9 years old can do most arcades except two of them. Service was awesome on a weekday. Highly recommend this! Okay funny, but can’t play too long time, bcos would feeling unwell. Okay funny, but can’t play too long time, bcos would feeling unwell. 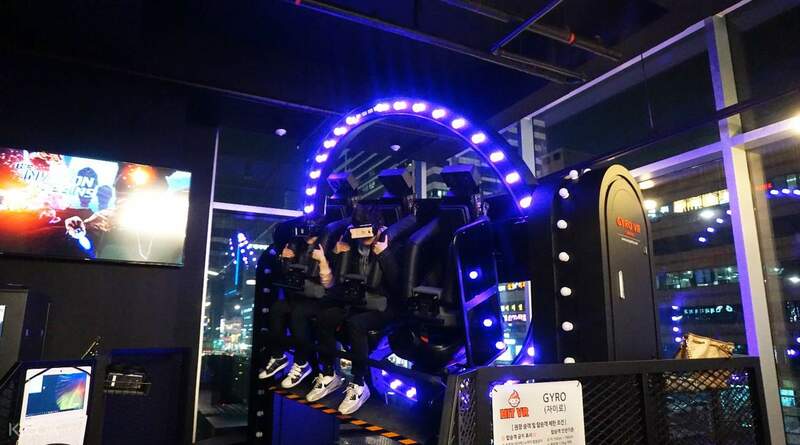 There are about 6 VR rides and 5 rooms that are preprogrammed with a small selection of games from Steam (one of which is multiplayer). Good fun for a couple of hours - you should be able to do everything in that time. There are about 6 VR rides and 5 rooms that are preprogrammed with a small selection of games from Steam (one of which is multiplayer). Good fun for a couple of hours - you should be able to do everything in that time.